Fruit Soak - For the fruit soak, toss the candied orange peel and all of the dried and candied fruits together with the sherry (or brandy), orange juice, orange zest, lemon zest and ginger. Cover and chill this mixture at least overnight, up to 3 days, stirring occasionally. Cake - Preheat the oven to 300 F and grease 2 9-inch round cake pans. Beat the butter and brown sugar until well light and fluffy. Add the eggs one at a time, beating well after each addition. Stir in the ground almonds. In a separate bowl, sift the flour, baking powder and salt and stir this into the batter. Stir in 1 cup of the sherry or brandy. Fold the chopped pecans into the batter then add the soaked fruits, stirring well to coat the fruit. Spoon this into the prepared pans and spread to level. If you wish, arrange pecans on the top of the cakes in a ring. Bake the cakes for 2 hours and 15 minutes, until a skewer inserted in the centre of the cake comes out clean. 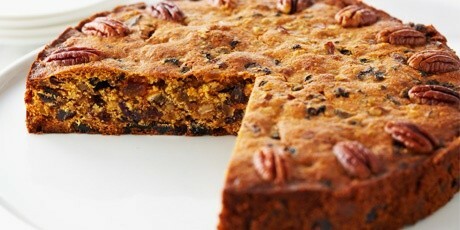 While still hot from the oven, brush the tops of the fruitcakes with some of the remaining 1 cup of sherry or brandy. Brush again one or 2 more times as the cakes cool, then remove the cakes from their pans and wrap well. 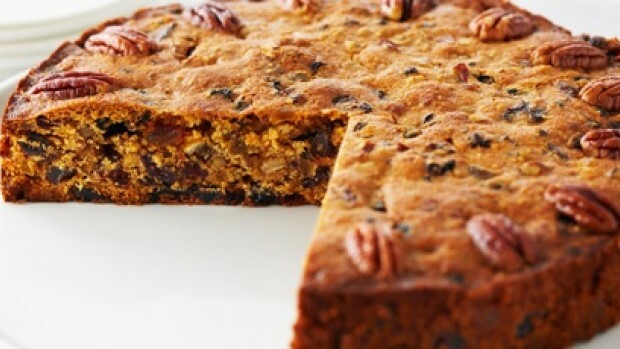 The fruitcakes will keep for up to 8 weeks in a cool place, or can be frozen for up to 6 months.